Heuchera Firefly grows in full sun to light shade near the coast and in full shade for inland gardens. In the wild I have usually seen the Heucheras in shady north facing slope areas and in misty waterfall zones. I have grown them in the garden in dry shady conditions and they are on my list of dry shade favorites. Heuchera Firefly will do well on intermittent deep soakings. Heuchera Firefly shows off with a knockout round of blooms in the spring and a smattering of flowers the remainder of the year. For me Heuchera Firefly has proven to be one of the most floriferous varieties. 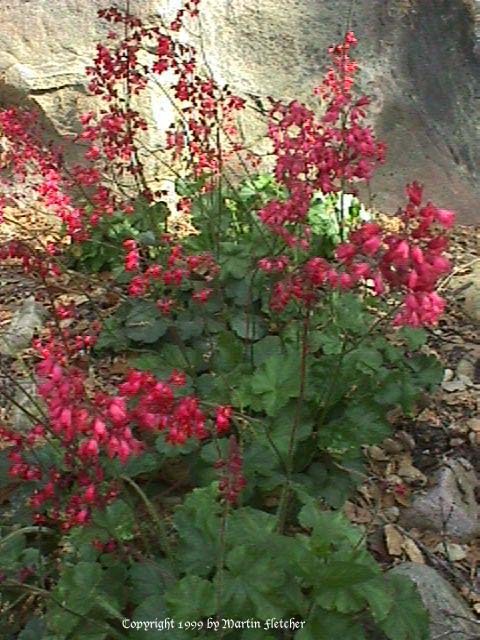 Red flowers and foliage of Heuchera Firefly - Coral Bells.